Vatican | What Can I Say ? Boy, am I lucky! 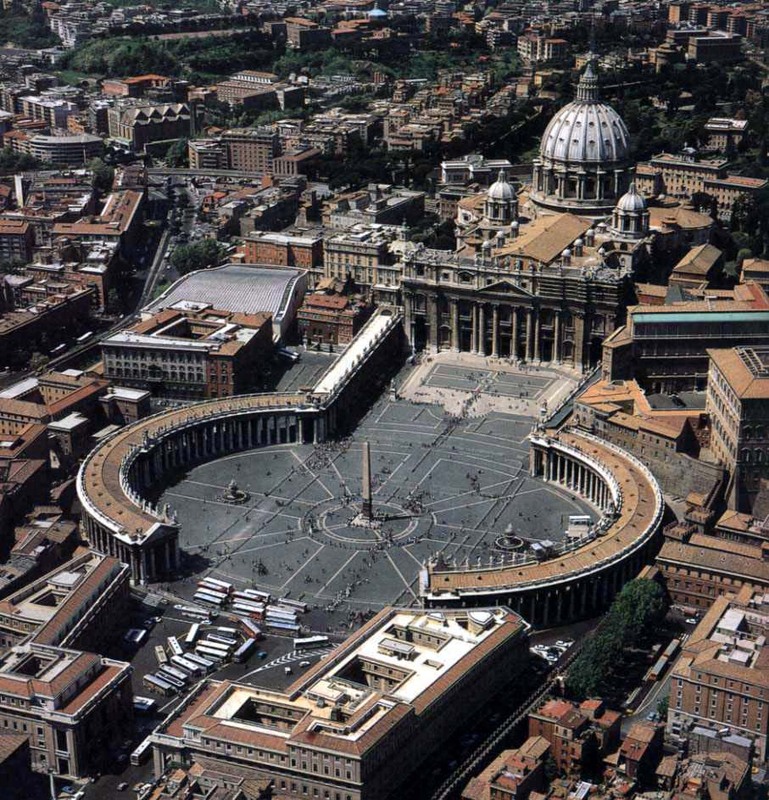 As you know, the Vatican recently decided to rent out some of the Papal apartments after realizing that Benedict XVI really didn’t need all that room: a little reading, a little resting, a little speaking ex cathedra… that doesn’t require a lot of space. With that in mind, the Holy See held a lottery for all the available apartments, and I was one of the lucky winners. I say “lucky” because the view is great– you know they’ll NEVER build view-ruining condos nearby. Also, the rent is very affordable. If the concierge had told me that it would cost me three hundred million lire a month to live there, I might have blanched, but 3000 Euros sounded so much more reasonable… I would have been a fool not to move in! Also, everyone knows that St. Peter’s Square is made of concrete instead of grass, so there are no maintenance fees that we all have to chip in for– and no condo associations! It sounded perfect, and I moved in just last Monday. I spent that happy first day dusting the filigreed putti that decorated the ceilings, which meant that I had to search Rome for a tall enough ladder; to my chagrin, all the ladder-renting shops in Rome are only open on Friday mornings from 6 to 9. Luckily I was able to borrow one from the man who cleans the top of the obelisk every Saturday afternoon. (Pigeons are everywhere!) The little angels seemed happy that I was there to brush the cobwebs from their eyes– all the better to view the frescoes on the walls below. Those are wonderful, incidentally– the masterpiece above my kitchen sink features a sixty-by-ninety foot fresco of the Israelites crossing the Red Sea, the Egyptians on their horses in hot pursuit. When I turn on both faucets full blast, it adds to the realism! I settled in that first week, happy to wander the vast rooms, and restraining myself from Windexing the bust of Pope Sixtus I that rests on the bureau facing my bed. (The lease agreement forbids such desecrations, though I tell you my hands are itching to wipe away twenty centuries of dust.) Of course, his staring face is 200 feet away from where I rest my own head, but still; I’m just saying. Everything was perfect until the following Sunday. I’d decided to sleep in, figuring I’d go to the Last Chance Mass in the late afternoon, which is the liturgy for people who are lazy, who work on Sundays, and who would rather spend the morning brunching on La Via dei Condotti. (All venial sins, by the way.) Happily snuggled dreamily into sheets that any number of Papal visitors may have wrapped themselves in, I was awakened by a dull roar. Thinking it was another of those dreams in which I am applauded and praised by the multitudes, I smiled myself awake– and realized the applause was for someone else because I found myself most definitely alone. I went to the window overlooking the square, raised it open, and peeked out. Imagine my surprise– there, just to my right, was Benedict himself, on his balcony, receiving the clamorous plaudits of the tens of thousands who had amassed themselves below. How could I sleep through all that? I leaned further out and caught his attention. “Holy Father? Excuse me a second!” He turned slowly and faced me. “I’m paying a lot of money to live here. No offense, but do you think you and they (I pointed south) could keep it down a bit? I really need my rest, but I promise I’ll be at the five o’clock Mass later. Deal?” He looked at me like I was pazzo, which indeed I am, and then he turned to the crowd again and raised his arms; they grew instantly silent. “Thank you… grazie!” I said, and closed the window. You see? All you have to do is ask nicely, and you can get anything you want in this world. Anything! The Swiss Guards paid a call on me the next morning. Not only was I severely reprimanded in fourteen languages, but I had to commit to a Penance which involves waxing the floor of the Basilica on my days off. “There’s not that much wax in all of Rome,” I cried, but they swore they would have plenty flown in. They say people who win lotteries often come to a bad end… they’re right!